Have you taken shocking video footage on your camera or mobile phone? Would you like to sell it to the national press? You’re in the right place! Talk to the Press helps hundreds of people sell their stories, photos and videos to the press every day. Simply fill out the story valuation form, or call our hotline, to find out what your story is worth. There is no obligation, and nothing will be printed without your say-so. 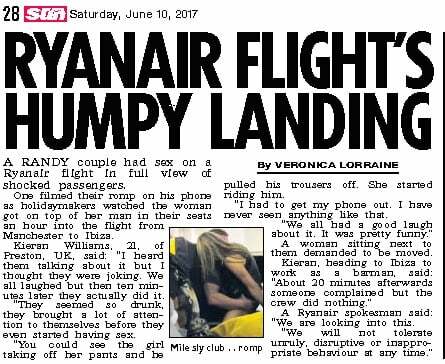 It was quite a week for Kieran Williams who filmed one of the most widely watched videos of a couple romping on a RyanAir flight. Kieran, 21, was on his way to Ibiza when he was gobsmacked to see two passengers on the budget airline begin grinding in their seats, in full view of everyone on board. He assumed he was joking but ten minutes later the passengers were shocked to see the man and the woman going at it in their seats. Kieran filmed two videos of the couple and the hilarious reactions of their fellow passengers. As soon as he landed, Kieran got in touch with us by sending a story form through our website. He asked whether we thought his video could make any money. We immediately advised him to not post the video on social media or share it with his friends on Whatsapp as we didn’t want anything to ruin his exclusive. We placed the video with the Mail Online where it racked up an astonishing 1 million hits. Because of the video’s fantastic performance, we were able to secure Kieran a great fee. A wave of other sites – including AOL and the New York Post – also featured the video, increasing Kieran’s fee. We then offered the story to papers and were delighted when it appeared in The Sun, The Daily Star and The Daily Mirror, all adding up to a bumper fee for Kieran who had the wit to film the raunchy antics. Have you got a shocking video footage you’d like to sell? Have you got a video on your phone that should be in the press? Do you want to go viral? If so, get in touch by filling out a story form or calling 0207 549 5419. We work in your interests, to get you the best fee possible for your content and make the process as smooth as possible. If you are unsure and want some free advice, just give us a call. Our service won’t cost you a penny, there is no obligation, and we will never publish anything you send us without your prior consent. For more information about how our service works, you can read the Sell My Story – How it Works page. Or for other ways to contact our journalists, see the Contact Us page. ← Previous Story Victim of discrimination? Share your story.